The southwestern Cape where the three large indigenous cyprinid species of interest to yellowfish enthusiasts occur, namely the Berg-Breede whitefish, Clanwilliam sawfin and Clanwilliam yellowfish, has experienced a better rainfall season this year. This has benefitted habitat quality and quantity, especially during the dry season (October to March). The Rondegat rehabilitation project continues to be a success, with ongoing recovery of the 4km stretch of river cleared of smallmouth bass. The two redfin species (Clanwilliam and Fiery redfin) continue to expand their numbers and distribution in the rehabilitated area, and encouragingly there has been an ongoing increase in the numbers of Clanwilliam yellowfish. Intensive monitoring of the river (thanks to Water Research Commission funding) has been replaced by long term monitoring of the recovery of the fish populations. There has been very limited progress with the Krom rehabilitation project because of a 12 month delay in the signing of the three year contract between CapeNature and DEA: Natural Resource Management Programmes. The contract is expected to be signed in the next month or two which should see the project; which encompasses the Krom, Biedouw and Breekkrans rivers (all in the Cederberg) and Groenvlei Lake (southern Cape), implemented over the next three years. The focus on Groenvlei is to control the burgeoning population of carp by manual methods. Carp were illegally stocked in the vlei in the 1990s. Please find below a questionnaire compiled by Prof. Nellie de Crom of North West University on the Vaal River spill and its aftermath. Will you please distribute it to your friends and colleagues especially to visitors, recreational users, residents and stakeholders who engage with the Vaal River between the Vaal Dam Wall (upstream) and Vermaasdrift (downstream). Please participate by clicking here. The August newsletter was all about the pollution in the mid-Vaal reaches but in the meantime the rivers in the Pretoria area are almost as bad according to Mariette Lieffrink of the FSE (Federation for a Sustainable Environment). 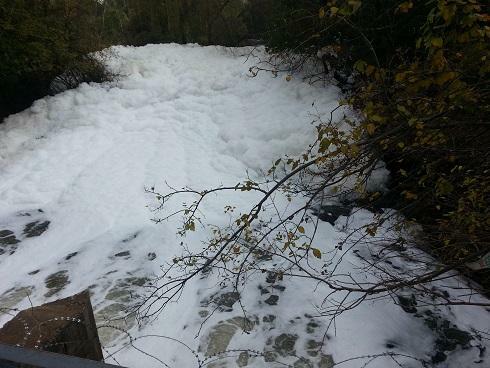 Below is one of the photos of the foam-covered Hennops River which was included in a report to the DWS (Water Affairs & Sanitation) in July.